The Empire controlled Thai military on Thursday 22nd May, 2014, launched a coup, declaring that it was “necessary to seize power.” The head of the Thai Army, Gen. Prayuth Chan-ocha, made the announcement on television flanked by senior military officers. The Thai news media reported that political officers who were attending a meeting called by the military had been detained. Curfew imposed, all TV & radio station broadcasts halted. Thailand’s army has directed all television and radio stations to put their normal broadcasts on hold and air only army material shortly after a military coup was announced following months of political stalemate and turmoil. "All radio and television stations, satellite and cable, must stop normal programming and broadcast army content until told otherwise," Winthai Suvaree, a deputy army spokesman, said in a televised statement. The coup came after the introduction of martial law on Tuesday and follows a long history of coups in Thailand. 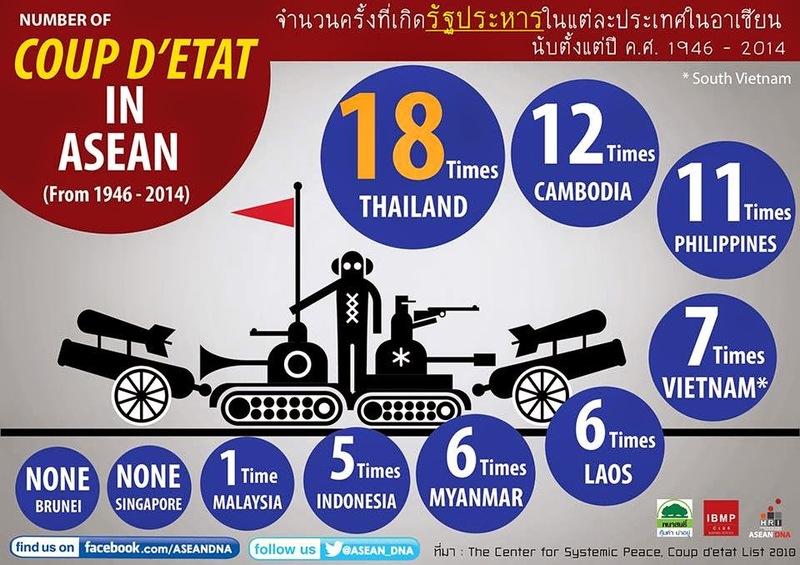 The last coup in Thailand was in 2006 and had been followed by more than a year of military rule. Thousands of protesters were on the streets when General Prayuth made his announcement. Thailand’s king, Bhumibol Adulyadej, part of British Empire, is 86 years old and ailing. He has been on the throne for more than 60 years. The Thai government has been paralyzed by protests for the last six months. Protesters have sought to eradicate the country’s most powerful political family, the Shinawatras. The country’s politics have been turbulent since 2006, when the military removed Thaksin Shinawatra, the patriarch of the family, who founded a populist movement that has won every election since 2001. General Prayuth did not mention anything about elections in his announcement. Elections in February were boycotted by the opposition and blocked by protesters. 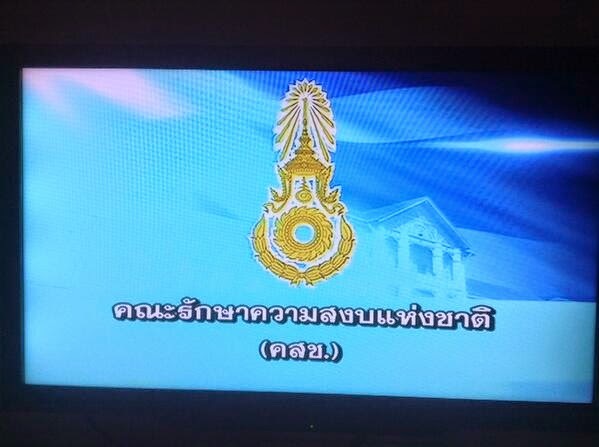 The coup announcement was made after the Thai stock market was closed. And just as Adolf Hitler constructed militant wings to protect his unwarranted power and influence, so too has Thaksin Shinawatra. His "United Front for Democracy Against Dictatorship" or UDD, also known as "red shirts," are Thailand's equivalent to Adolf Hitler's Brownshirts and Schutzstaffel (SS). Just as Hitler's militant wings carried out campaigns of mass murder, assassinations, and other forms of political intimidation, so too have Shinawatra's "red shirts." 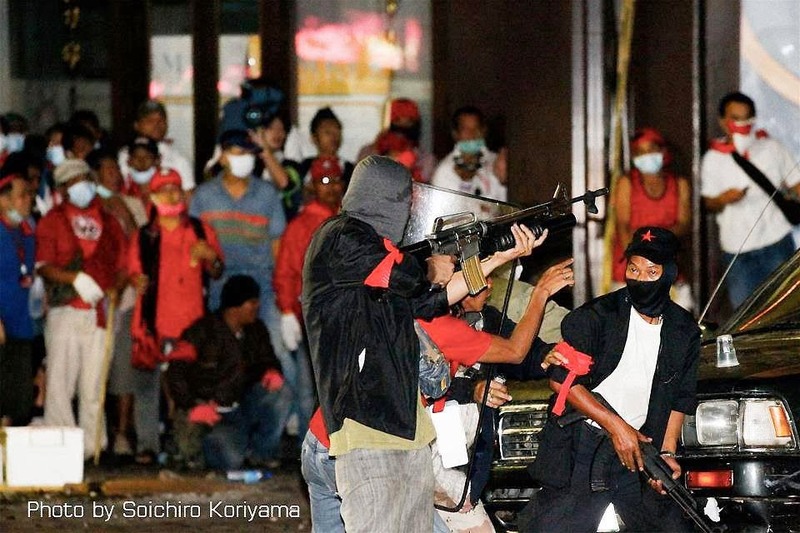 In 2010, Thaksin Shinawatra deployed some 300 heavily armed mercenaries to augment "red shirt" mobs in Bangkok. Armed with M16s, AK47s, M79s, hand grenades and other small arms, they assassinated an army colonel, killed soldiers, bystanders and even protesters among their own ranks in reckless firefights that spanned several weeks and climaxed in a campaign of mass arson across the capital. In all, over 90 would die. They have threatened to kidnap and/or kill Thai Royal Army Commander-in-Chief Gen Prayuth Chan-ocha's twin daughters. On the eve of February 2014 general elections, the "red shirts" carried out a brazen broad-daylight assassination of NGO worker, activist, and protest leader Sutin Taratin. Regime militants carried out a grisly attack in the eastern province of Trat that left scores maimed and a five-year old girl dead and a similar attack carried out in Bangkok that left many maimed along with a woman and two children killed. Multiple M79 grenade attacks were carried out on the office of the National Anti-Corruption Commission in northern Bangkok in conjunction with a blockade carried out by the regime's "red shirts." 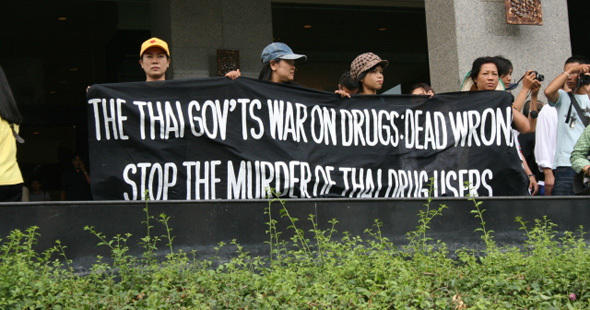 The blockade was aimed at obstructing criminal proceeding against then prime minister, Yingluck Shinawatra. Regime supporters would be arrested for possession of AK47s, M79 grenade launchers, and RGD-5 hand grenades, the latter two with lot numbers matching those used in previous attacks across the city. Recently, an accidental discovery was made by police of a white Mazda parked outside the resort of regime MP Sitthichai Kittithanesuan, containing AK47s in the backseat. The car was owned by an "adviser" to a regime minister. Regime militants carried out an M79 grenade attack and drive-by shooting on Bangkok's Democracy Monument on May 15 that killed 3 and left dozens more injured. Image: Bangkok residents welcome the presence of troops. In light of the extensive, enumerated documentation of Thaksin Shinawatra's agenda and the means through which he has sought to achieve it, a clear and present danger can clearly be seen rising in the midst of Thailand's political landscape. That his "red shirts" intentionally utilize rhetoric and organizational strategies employed by Maoists and the Khmer Rouge ("Red" Khmer), is particularly alarming. The trajectory of Shinawatra's abusive authoritarianism has already made him the worst human rights abuser in Thailand's long history. With history's lessons in hindsight, do catastrophic losses in human life, civil war, and genocide really need to begin unfolding before Thailand's independent institutions take action? Soldiers and police searched a house Nong Muang district on Tuesday night and detained Chawawat Thongpuak, 54, a former ranger from Lop Buri, Pol Maj Gen Montri Yimyeam, Lop Buri police commander, said. They found an AK gun, along with 1,150 bullets of various calibres and 21 home-made explosive devices, including 11 TNT bombs, one metal pipe bomb and five plastic pipe bombs. The weapons were hidden under his bed and in a cluster of trees behind the house. Mr Chaowawat admitted he was hired by two women in Bangkok to provide weapons and make the bombs, which were to be sent to Bangkok, Pol Maj Gen Montri [said]. The seizure of weapon caches and related arrests are expected to continue as solider carry out duties the current "civilian rule" has intentionally failed to carry out - or worse yet, have been facilitating all along. The military will also most likely oversee and enforce a series of court cases aimed at the Shinawatra regime, as well as its safe removal from power and the installation of a caretaker government to administer the country until reforms can be carried out and elections held. Thailand's "Operation Valkyrie" is in the opening stages of implementation. It is not a "success" yet, but has made it further than the 1944 German model upon which it is based. The Thai military’s imposition of nationwide martial law is effectively a coup that threatens the human rights of all Thais, Human Rights Watch said today. The United States and other influential governments should call for the immediate restoration of civilian rule and an end to censorship. The broad and unchecked powers granted to the military under the century-old Martial Law Act undermine human rights and fundamental freedoms, due process of law, and democratic governance in Thailand. HRW's disingenuous hand wringing over "human rights" smacks of particular hypocrisy, as no mention is made of the campaign of systematic violence carried out by those among Thailand's "civilian rule" preceding - and in fact prompting - the military's decision to step in. HRW's concern over "democratic governance" and its insistence on holding elections echoes rhetoric of the regime itself and was suspiciously absent in the face of the flagrant undermining of both the rule of law and democratic principles during 2011's general elections. It was then that Thaksin Shinawatra - a convicted criminal and fugitive hiding abroad - openly contested general elections, admitting his sister, Yingluck Shinawatra, was merely his stand-in. There is no question that an accused mass murderer and convicted criminal hiding abroad from a 2 year jail sentence, multiple arrest warrants, and a long list of pending court cases, is illegally running Thailand by proxy. Being unelected, Thaksin Shinawatra is by all accounts a dictator, and his "government" an illegal, illegitimate, proxy regime, however cleverly they try to dress it up. Human Rights Watch's failure to condemn this, and insist that elections be held with Thaksin Shinawatra's participation undermines democracy in ways no military coup ever could. 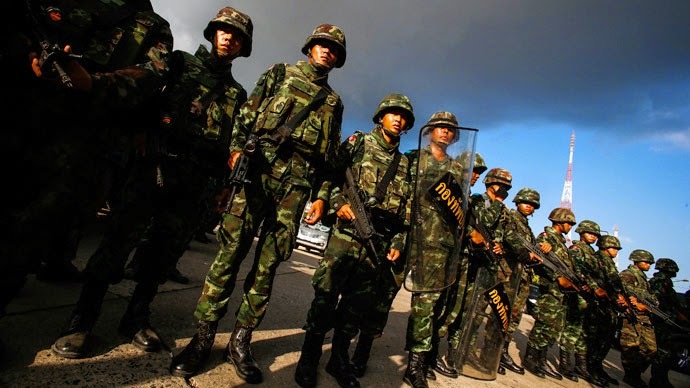 The Thai military has moved when special interests, criminality, and cowardice has prevented all others from stepping in and restoring order in Thailand. The West's adamant opposition to the move, and any attempt to appoint a caretaker government that will further undermine and distance the Shinawatra regime from the levers of power is indicative of the partial stance it takes in the pursuit of its self-serving interests, and at the expense of its own legitimacy and the alleged principles of "democracy" and "human rights" it poses as the premier universal champion of. The Thai military's ability to succeed where the German army failed in 1944 will in part depend on the "energy and attitude" of the Thai people and their friends and allies across the globe, in support of the truth, and the implementation of necessary measures to fully and permanently excise the Shinawatra regime from Thailand's political landscape. In the US, already in 2014 thirteen states have introduced resolutions urging Congress to reinstate the banking separation measures of Franklin Roosevelt's 1930's Glass-Steagall Act. Those states are Alabama, Arizona, Kentucky, Louisiana, Maryland, Minnesota, New Mexico, New Jersey, New York, Rhode Island, Virginia, Washington State and West Virginia. In Maryland, Minnesota and Rhode Island, there are matching resolutions in both the House and Senate. In an additional 5 states, resolutions introduced last year have carried forward into this year and remain active. Those states are Massachusetts, Pennsylvania, Michigan, Illinois and California. Join the fight to reinstate Glass-Steagall by calling your Senators and Representatives today!